Screw feeders are for transportation of various powdery matter. Transport of materials can be horizontal or at angle. Dosing is done with screw spiral and depending on the biochemical characteristics of the material that is being transported, we choose materials for construction. 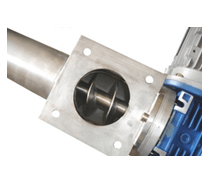 Screw feeders find applications in various branches of production, and the most common are in the food industry. Screw feeders are manufactured according to the customer request, the selected diameter spiral steps according to your request or our recommendation. Our screw feeder is accepted as a technical solution that is approved by the Faculty of Mechanical Engineering no. 3164/1, 2011. Screw feeders are for transportation of various granular materials. Transport of materials can be horizontal or at angle. Dosage is done with screw spiral and depending on the biochemical characteristics of the material that is being transported, we choose materials for construction. 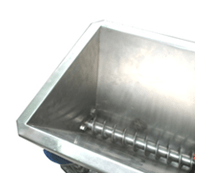 Screw feeders f find applications in various branches of production, and the most common are in the food industry. Screw feeders are manufactured according to the customer request, the selected diameter spiral steps according to your request or our recommendation. 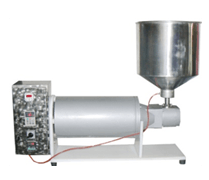 Doser is designed for dosing of chocolate in jars and other packaging, but can be used for dispensing all types liquid matter used in confectionary. On this machine can dispense chocolate in packages of different sizes with the largest volume of up to 1000 g with a certain parameters need to be adjusted. You want to send us a message related to Dosers.